Are you like me and wash your dishes before you put them in the dishwasher to get washed? Well, put your pre-soaking days behind you, and lighten your load with Cascade Complete All-in-1 ActionPacs. They break down, dissolve, and rinse away tough food particles, leaving your hands free and your dishes sparkling. Sound too good to be true? We dare you to take the 24 Hour Challenge. Bake a Blueberry Cobbler. * Enjoy! Without rinsing, put it in the dishwasher with Cascade Complete. Well, I took the challenge and really didn't think it would work to be honest. But you know what it came out spotless. No more washing my dishes before putting them in the dish washer! You can try it for yourself! Walmart has trial size packages for less than $1! 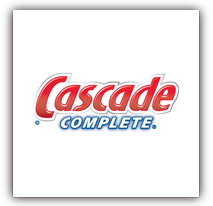 So what are you waiting for go out and try Cascade Complete. Thank you to Blogspark and P&G for the opportunity to review Cascade Complete. 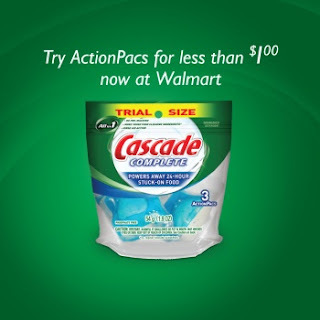 They sent me the Cascade Complete All-in-1 ActionPacs kit, 6 trial packs of Cascade Complete All-in-1 Action Pacs, and a $15 Walmart gift card. Love that you plugged WalMart!